A few days after my Easter barbecue, I wanted to try using my Saber Grill on my own since my brother and cousin had done all the grilling that day. I knew just the recipe I wanted to experiment with for my first time. Tony of SinoSoul dropped off some lettuce, cilantro, and lavender from his garden. 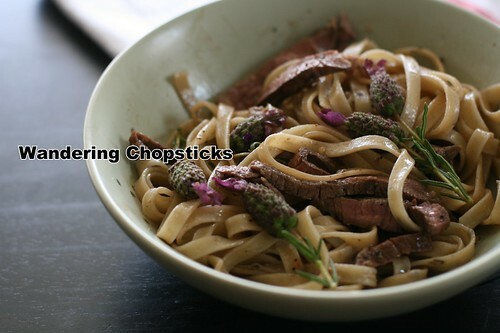 I vaguely remembered coming across a recipe long, long ago for lavender-grilled steak. 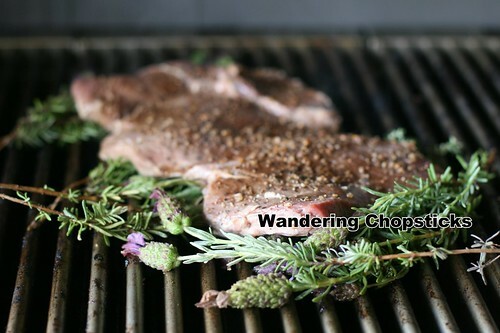 I don't remember any pictures accompanying the article so I don't know what it was supposed to look like, rather the writer focused more on waxing poetic about the aroma of lavender on the grill. Lavender in desserts I was used to, but paired with steak was something that never occurred to me before. I tend to prefer French lavender for cooking, but I'm not one to turn down any type of free lavender. In the end, I think the muted fragrance of the Spanish lavender that I used nicely complemented the steak without overpowering it. 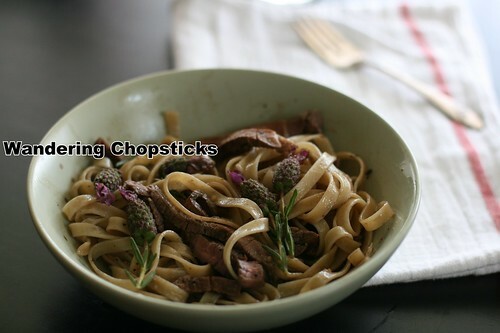 I sliced the lavender-grilled steak and tossed it with some lavender fettuccine from Pappardelle's Pasta that lil' sis brought back for me from a trip to Seattle's Pike Place Market. I kept the pasta simple and just drizzled some olive oil and balsamic vinegar. 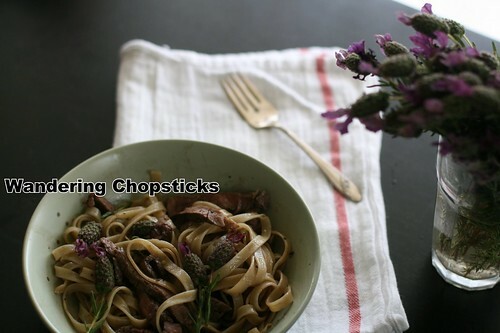 If you don't have lavender fettuccine, obviously, just regular pasta will do. 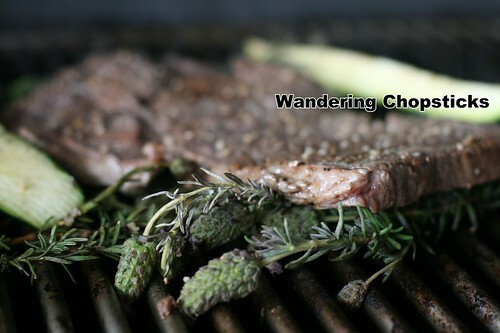 And if you don't have fresh lavender on hand, you can add dried lavender to the steak rub, or use herbes de Provence. Season your steak with your choice of steak seasoning. I like Montreal steak seasoning, but I imagine an herbes de Provence blend would be nice too. Set aside for about 15 minutes. Boil and drain the pasta. Wash the lavender and thyme sprigs. 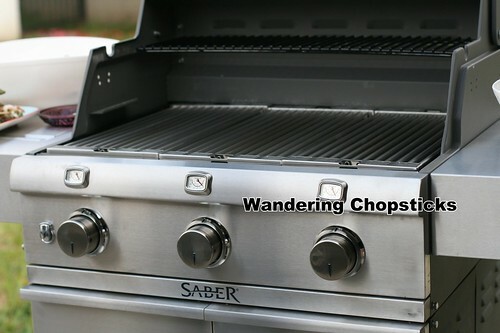 Once I turned on the gas tank, turning on the Saber Grill was just as simple as using my stove. Turn the knob and push the ignition button to light up the grill. Since I only had one steak, having three independent grills meant I could use one section, saving gas and cleaning. 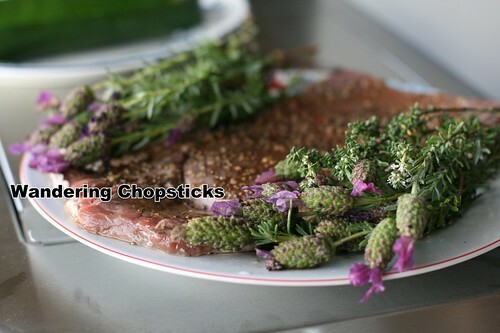 Once the grill is hot, loosely lay down the lavender and thyme in the center, and place the steak on top. I wanted the herbs to release their aromas while cooking, but also enough space in between for the steak to get nicely grilled as well. I used a pretty think cut of steak, so only a few minutes and it was time to flip. When the steak is done, remove from the grill and let it rest for about 5 minutes. Discard the grilled herbs. 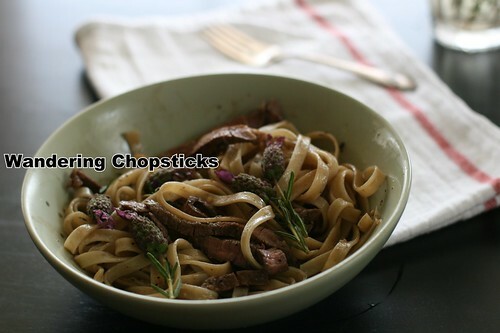 Meanwhile, toss the pasta with olive oil and balsamic vinegar to your liking. 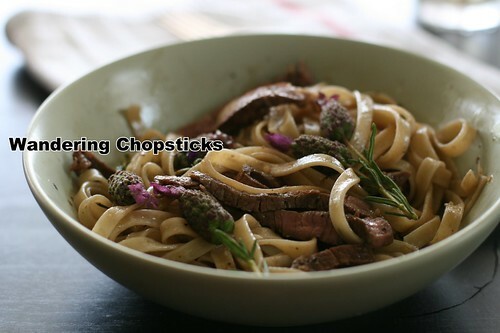 Slice the steak and add to the pasta. Add a few sprigs of lavender if you'd like. Because the lavender is just too pretty not to. I felt like I was eating the South of France in a bowl. 3 years ago today, hot pot at Happy Sheep Cafe - Rowland Heights (Closed). 5 years ago today, filet mignon pho Bac at Pho Huynh Vietnamese Restaurant - South El Monte. 6 years ago today, a little lesson on ancestor worship and my great-grandfather's death anniversary dinner.